With MailStore, you can offer your customers tamper-proof and mandatory e-mail archiving, regardless of their size and service structure, whether through the MailStore Server on-premise solution or MailStore Service Provider Edition for e-mail archiving as a Service. 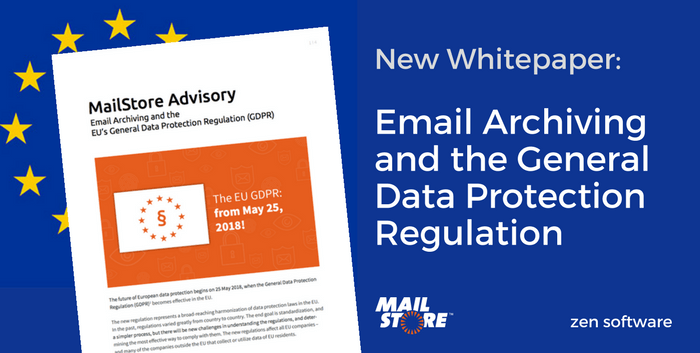 MailStore already fulfills one of the key requirements of the GDPR, which is secure, accessible, transparent handling of personal data. Providing information, forgetting and protecting against unauthorised access has been part of the solution at MailStore for years. How these features now play a key role in GDPR compliance is summarised in the whitepaper for your customers – download now for free. Get in touch, visit our website, watch one of our MailStore videos, or download the free 30-day trial to find out how MailStore or the MailStore Service Provider Edition can help your business. ← BackupAssist 10.3 Introduces WebDav Support – An Rsync Replacement?